By now we should all be on board with the idea that texting while driving is a particularly dangerous and irresponsible thing. But how does it affect one's driving within Mario Kart? A physician and some elementary schoolers found it significantly increases the risk of driving backwards, among other hazards. The study, led by Dr. Jen Gunter, appeared in the latest edition of her personal blog and its findings will be presented at a school science fair later this year. 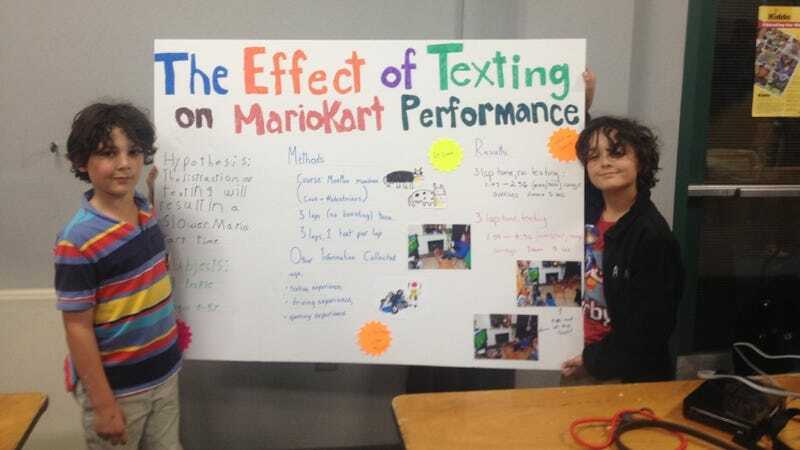 Its conclusions are grim: "The risk of a crash (fence and cow), driving off the track, and driving backwards among Mario Kart drivers significantly increased with texting," says the study, "thus texting resulting in signifcantly slower times." In Gunter's study, nine human subjects of various ages were asked to play Mario Kart Wii using the Wii wheel. They were required to race as Toad in a standard kart with no boosting "to facilitate objective assessment." Moo Moo Meadows was the test course. Users drove three laps without distraction, then three laps in which they received one text message on a smartphone per lap. Test subjects then had to answer a typical question ("What did you eat for lunch?") and if they failed to respond, suffered a 30-second time penalty. The average time to complete a lap jumped significantly between texting and non-texting rounds (2:03 non-texting; 3:31 with texting.) "During the texting laps the slower time was the result of the car going off track (with reduced speed on grass), collisions with cows, crashing into the fence, and inadvertently driving backwards," the study says. Significantly, only one driver—likely someone's smartass dad—"took his hand off the gas button and stopped his car to answer each text." For all the others, the typical modes of distracted driving were observed: "Attempting to keep the phone in the same line of sight as the television screen, holding the phone off to one side to text while glancing back and forth between the phone and the screen, and completely abandoning all view of the road to answer the texts." "The yelling of the crowd, the general hurling of insults, and bragging of both drivers and observers did not significantly impact performance," Gunter notes. Disclaimer: "The study was not approved by any human subjects committee as that was not a requirement of the elementary school science fair."